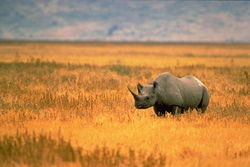 Conservation efforts have more than doubled the number of black rhinoceros in African reserves over the past decade. There are currently about 4,700 of the critically endangered rhinos, up from a low of nearly 2,100 in the early 1990s. The WWF created the Black Rhino Range Expansion Project to increase the number of black rhinos by moving populations to newly established habitat areas, which helps to increase breeding rates. Growth rates at some range expansion sites have topped 7% per year. Since 2003, the project has translocated 98 black rhinos to 6 different sites resulting in the births of at least 26 calves. As part of its successful range expansion program, WWF will translocate 20 additional black rhinoceros to new landscapes in 2011, according to an agreement with a South African wildlife agency.